It's Time for a Checkup. Get Your FREE eBook Now! software is in with our eBook. A complete solution that combines best in class responsive websites, complete search marketing strategy and contact center. A core function that makes document storage ans haring easier for owners and tenants. Expedite communication with your management team and tenants in a secure environment. An accounting solution that effectively streamlines back-office functionalities, enabling your staff to handle more properties. An expedient evaluation process that helps reduce maintenance costs and streamline processes. Real-time reporting from a multi-tier database that gives you the data you need to make profitable decisions. A payments processing system that provides convenient online and in-office options, and cuts transaction costs. 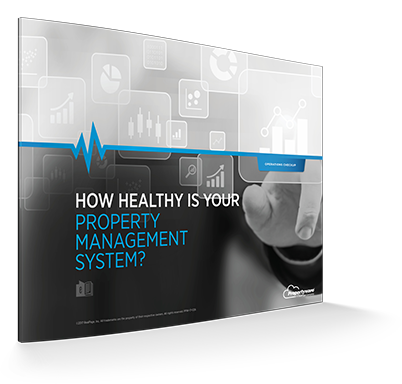 An integrated SaaS property management system that centralizes practically all aspects of operations to increase revenue and reduce expenses to manage your business anytime, anywhere.